When it comes to share purchases--as with "new" EVE players--there's often more than meets the eye. Case in point, Glitch 5406. 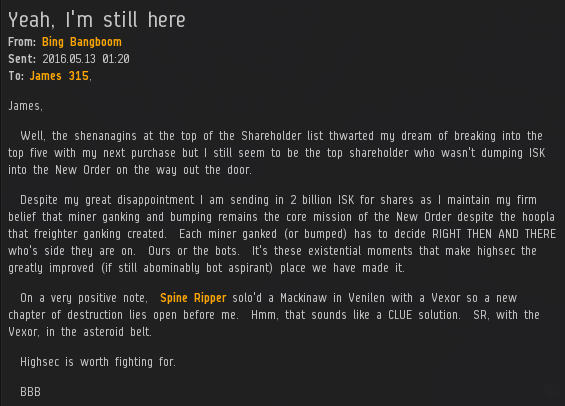 His humble purchase of 43 shares was, in fact, calculated to be precisely enough to send us to the 1 trillion 24 billion isk mark. Glitch's cleverness helped him earn a Supreme Protector's Tip of the Hat™. Another of the many good reasons why people buy shares in the New Order: Because their thirst for the destruction of bot-aspirancy has not yet been fully quenched. The inimitable Agent Bing Bangboom made a triumphant return to the shareholder conversation this week with a purchase of 2,000 additional shares. His plan to crack the Top Five was thwarted, but only for the time being. Bing brought us over the 1 trillion 25 billion and 1 trillion 26 billion isk marks. For now, Bing will need to be satisfied with the addition of another Double Supreme Protector's Tip of the Hat™ to his collection. Who knows what will happen next? Im still here and not dumping ISK just because. You're right. You are still ahead of me (for now). I better sell some more Strip Miners and get another billion together.